Back cover: "Orphaned, two sister are left to find their own way. Sweet and proper, Karah's future seems secure at a glamorous Flower House. She could be pampered for the rest of her life...if she agrees to play their game. Nemienne, neither sweet nor proper, has fewer choices. Left with no alternative, she accepts a mysterious mage's offer of an apprenticeship. Agreeing means a home and survival, but can Nemienne trust the mage? With the arrival of a foreign bard in the city, dangerous secrets are unearthed, and both sisters find themselves at the center of a plot that threatens not only to upset their newly found lives, but also to destroy their kingdom." 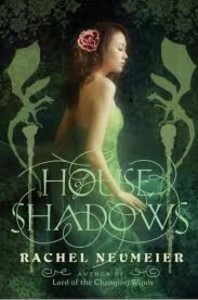 House of Shadows is an intriguing fantasy novel set in the fictional city of Lonne, where the men rule and women are treasured. The story is very much character driven and follows 4 characters: Karah, Nemienne, traveling bardic mage Taudde and Leilis, a highly regarded servant at the Flower House. When a stone merchant dies, leaving his 8 daughters ages 8 to 19 alone, they soon discover their father's friends have turned into business rivals and need to figure out a way to keep the business running. They have to resort to selling off two of the sisters for money to survive until the oldest daughter could marry. Karah is the most beautiful and goes to the Flower House where young woman are groomed to be flower wives. She soon catches the eye of the Prince. Nemienne is sold into an apprenticeship with Mage Ankennes, moves into his mysterious ever changing house and learns the way of magic and soon discovers a dark secret. The story is full of magic, political maneuvering, love, deceit and intrigue. The characters are warm and complex. I was fully drawn into the story and thoroughly enjoyed it. I've just started this but I know I'm going to like it -- I love character-driven novels. I have had my eye on this book for a while. I will have to see about getting a copy. Good review!